More Freakbeat and Psych insanities from Dig The Fuzz label. 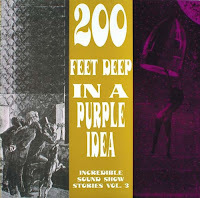 This volume, interestingly, features 2 french psych bands among the usual british Freakbeat fare. This is certainly only the tip of the iceberg and we are thinking of making a FOTH comp exploring the french psych/prog scene. Les Goths made only one but excellent 4-song EP, highly sought after, and Tacpoum Système made several psych 45, from which "Asmodai" is lifted. They sadly transformed into a prog band after this initial effort. All in all, this is yet another classic comp in the Bam Caruso mould. There is a small mistake in the tagging of one song: "XK 1LX" is by the Nashville Teens, not by The Lemon Drops, I'll let you correct that. The next FOTH volume "Pre-Kraut Pleazers" is ready and should be out and posted this week. Hold your breath and dive 200 Feet Deep In A Purple Idea here. "a FOTH comp exploring the french psych/prog scene" is certainly a great idea. There have been a few comps on that subject like "Tetes Lourdes" (a bit on the hard-psych side) or more recently "Wizzz" (2 volumes) but many gems remain very hard to find. If ever you're looking for a particular song for this project, don't hesitate to tell me, maybe I could help. I'm french, after all, so I've gathered a few rarities over the years. Thanks for your blog !!! c'est avec plaisir que nous ferons appel à votre savoir (anthologique, sans nul doute!) et à votre collection de vinyls que je soupconne d'être conséquente! Il vous suffit de m'envoyer un email en cliquant sur la chtite envelloppe en bas d'un post… N'oubliez pas de mettre votre e-adresse dans le corps du message, je ne sais plus si blogspot cache l'adresse de l'expéditeur. To anyone who might want to contact me with support, ideas for songs or themes for FOTH comps, just click on the small envelope at the bottom of any posts… don't forget to put a mention your email address somewhere in the message field. I can't remember if blogspot hides the sender's e-mail. On top of the Pre-kraut Pleazers, we also have a Sitar Special FOTH volume almost ready, I am quite pleased with it Buzz, buzz… but Sylvain wants more acid-punk stuff thrown in. Some MORE late-night discussions are needed.